Good news. We’re about to make your holiday shopping as easy—and delicious—as pie. 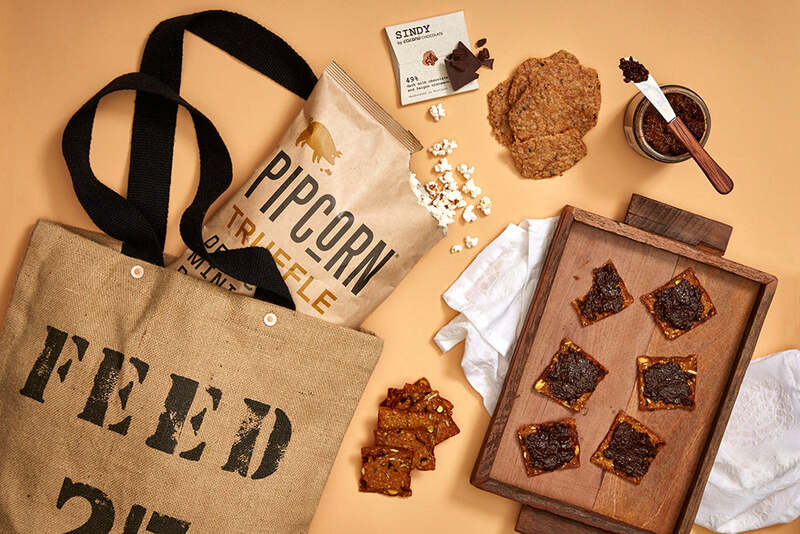 We’ve partnered with our foodie friends at Mouth on six FEED + Mouth Bundles, filling our most loved bags with carefully curated treats from indie food vendors around the country. The result? A very meaningful gift (each bundle gives school meals) for everyone on your list. Shop the bundles below to be on your way to Best Gifter status. Mouth is the ultimate online store for the best indie food, spirits + wine, and tasty gifts, all crafted in America by independent makers. Mouth’s mission is to celebrate food – real food – and the people who work around the clock to create it, with a high level of personal attention, craft and passion. And we are so proud to call them a partner, just in time for holiday gifting. Perfect for your coworker (who likes to share), a snack bundle to crunch down on. Cheesy, spicy, crackling, and popping… these are mouth-watering nibbles we always want stocked in our desk drawers, office pantries, and FEED bags! 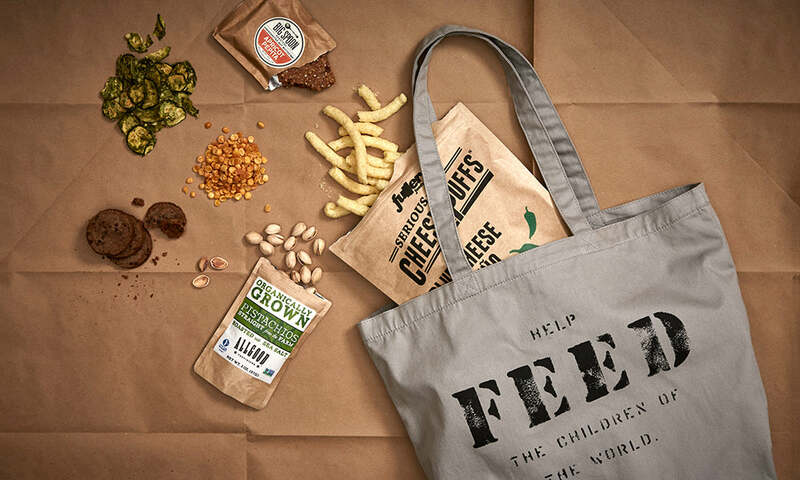 From the perfect blue cheese jalapeno puffs (a sensation) to fruity seed and nut bars for the wholesome snacker, all in a lightweight and foldable tote, this gift is sure to please. Not sure of what to get the seasoned gourmand or budding chef in your life? 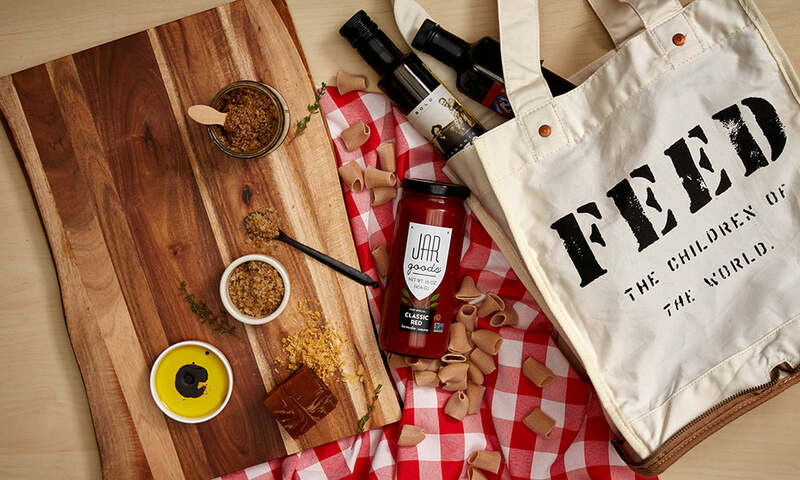 Try this carefully curated bag of show-stopping oil, vinegar, sauce, pasta, and condiments from indie makers across the country. Equal parts unique and delicious, and bundled in our original FEED 100 Shopper tote, look no further than this bundle of pantry items to give you major foodie cred (hello, perfect Jacobsen Finishing Salt). 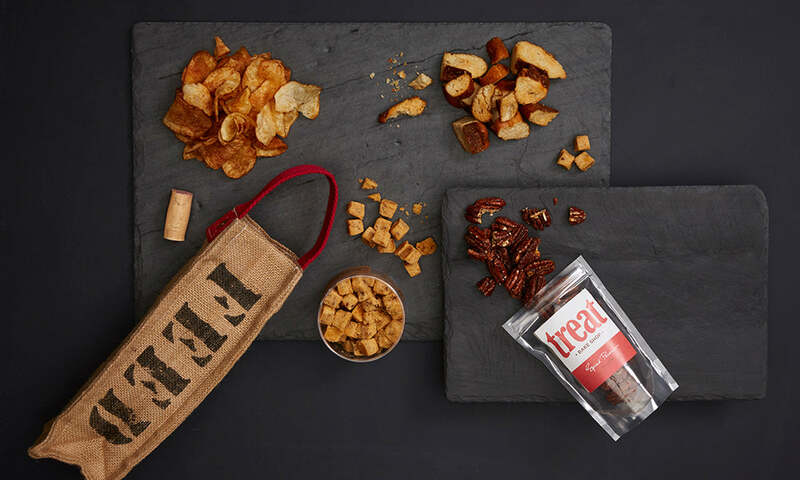 Sweet and savory – a pairing that’s as classic as this burlap FEED Bag. Made for your favorite nosher, this bundle of goodies hits all the right flavor notes. All she has to do is break out the crisps and cookies, set out some knives for the tapenade, and try not to dip into the white truffle popcorn before her guests arrive. From Secret Santa to “just thinking of you” surprises, this bundle will keep you ready for this season’s meaningful moments. It includes dulce de leche cookies, mint crunch, the best peppermint stick out there, and a jelly heart (yes, jelly). 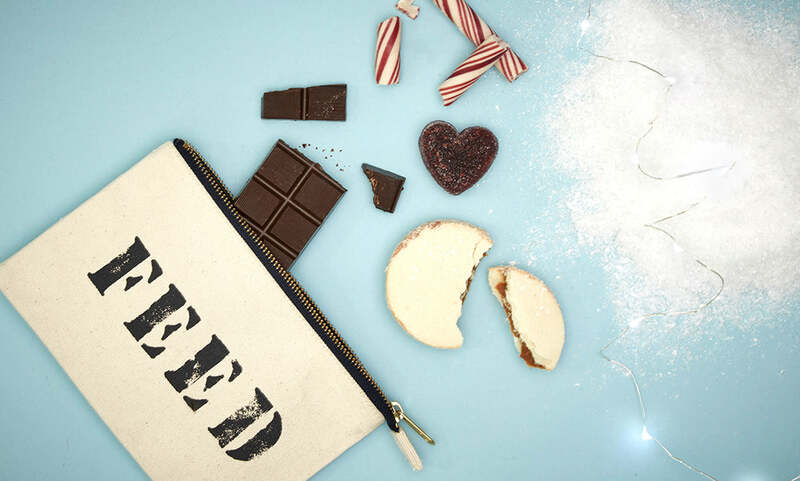 All of this is tucked in our classic pouch for a gift that FEEDs joy this season. 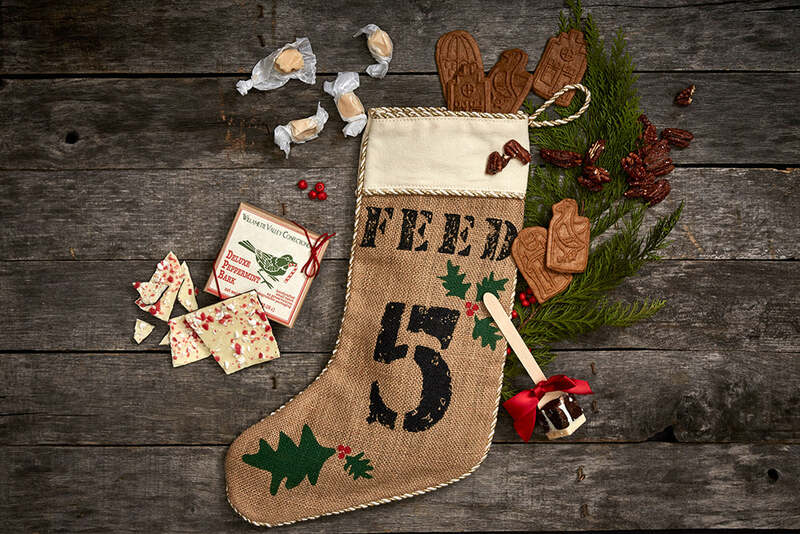 Filled with cool and discerningly sourced treats, this stocking will take you beyond the average candy cane and peanut brittle. Peppermint taffy and bark, beloved Speculoos, and a rich hot chocolate on a stick – we’re adding a decadent (yet impactful) spin on the holiday season. Hang the stocking, and you’re done!